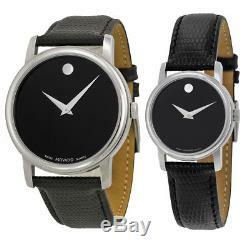 Movado Museum Black Dial Black Leather Strap Watch - Choose gender. Stainless steel case with a black leather strap. Black dial with silver-tone hands. The signature Movado dot appears at the 12 o'clock position. Water resistant at 30 meters / 100 feet. Ladies version (2100004): Case diameter: 26 mm. Mens version (2100002): Case size: 38 mm. Movado Museum Black Dial Black Leather Strap Watch. Marking items as a Gift. Under federal law we cannot not mark an item for a lower price or as a'gift. Items must be in new condition, meaning unworn with the security tab (if applicable) intact. Please write this number on at least three sides of the return box to ensure that the package clears security. Items received "Not as Described". Please inspect all packages when they are received. The item "Movado Museum Black Dial Black Leather Strap Watch Choose gender" is in sale since Friday, November 03, 2017. This item is in the category "Jewelry & Watches\Watches, Parts & Accessories\Wristwatches". The seller is "jomashop" and is located in New York City, New York. This item can be shipped to United States, Canada, United Kingdom, Denmark, Romania, Slovakia, Bulgaria, Czech republic, Finland, Hungary, Latvia, Lithuania, Malta, Estonia, Australia, Greece, Portugal, Cyprus, Slovenia, Japan, Sweden, South Korea, Indonesia, Taiwan, South africa, Thailand, Belgium, France, Hong Kong, Ireland, Netherlands, Poland, Spain, Italy, Germany, Austria, Russian federation, Israel, Mexico, New Zealand, Philippines, Singapore, Norway, Saudi arabia, Ukraine, United arab emirates, Qatar, Kuwait, Bahrain, Croatia, Malaysia, Brazil, Chile, Colombia, Costa rica, Panama, Trinidad and tobago, Guatemala, El salvador, Honduras, Jamaica, Antigua and barbuda, Aruba, Belize, Dominica, Grenada, Saint kitts and nevis, Saint lucia, Montserrat, Turks and caicos islands, Barbados, Bangladesh, Bermuda, Brunei darussalam, Bolivia, Ecuador, Egypt, French guiana, Guernsey, Gibraltar, Guadeloupe, Iceland, Jersey, Jordan, Cambodia, Cayman islands, Liechtenstein, Sri lanka, Luxembourg, Monaco, Macao, Martinique, Maldives, Nicaragua, Oman, Peru, Pakistan, Paraguay, Reunion.